JOLI VISAGE VITAMINC C 20% VITAMIN C FEATURES A SYNERGISTIC COMBINATION OF 20% L-ASCORBIC ACID (ASCORBIC ACID IS THE VITAMIN C ROYALTY AND IS CONSIDERED THE SUPERSTAR OF ANTI-OXIDANTS AND FORM OF VITAMIN C), COMBINED WITH VITAMIN E (ALPHA TOCOPHEROL), A KNOWN SKIN SOFTENER & ANTIOXIDANT WITH THE AMAZING BENEFIT OF FERULIC ACID IN HIGH CONCENTRATION ENHANCES PROTECTION AGAINST ENVIRONMENTAL DAMAGE CAUSED BY FREE RADICALS THAT CONTRIBUTE TO ENVIRONMENTAL DAMAGE, POLLUTION, AIR QUALITY AND OZONE POLLUTION. THIS MUST HAVE FORMULA PLAYS A POWERFUL ROLL IN CORRECTING PHOTO-DAMAGE, THE APPEARANCE OF LINES AND WRINKLES,AND THE LOSS OF FIRMNESS, WHILE BRIGHTENING SKIN'S COMPLEXION! FURTHERMORE, OUR EXCLUSIVE CLINICAL STRENGTH VITAMIN C SERUM IS A SCIENTIFIC FORMULA THAT HAS PROVEN RESULTS WITH L-ASCORBIC ACID INCREASING COLLAGEN SYNTHESIS, AND THE IMPORTANCE OF COLLAGEN FOR SKIN HEALTH IS PARAMOUNT. COLLAGEN FIBERS GIVE THE SKIN RESISTANCE TO STRAIN AND TRACTION. COLLAGEN CONSTITUTES ABOUT 70% OF SKIN MASS, BUT TOTAL COLLAGEN DECREASES ABOUT 1% PER YEAR. THIS MAY LOOK LIKE A SMALL DECLINE, BUT IN SUCH A MAJOR COMPONENT OF THE SKIN, IT WILL AFFECT SKIN VOLUME AND ITS PHYSICAL PROPERTIES. ALSO, AGING CHANGES COLLAGEN STRUCTURE: WHAT WAS AN ORGANIZED PATTERN IN YOUNG SKIN, IN OLDER SKIN CAN TURN INTO THICK FIBRILS ARRANGED IN DISORGANIZED BUNDLES. IT IS NOT “ONLY” QUANTITY, THEN, IT IS ALSO QUALITY THAT MATTERS. WE KNOW THAT AGING DECREASES SKIN THICKNESS AND ELASTICITY, AND IT IS LIKELY THAT COLLAGEN IS A GOOD PART OF THE REASON. IF WE CARE ABOUT SLOWING DOWN AND REVERSING SKIN AGING, WE SHOULD CARE ABOUT COLLAGEN TOO. THE EFFECTS OF ASCORBIC ACID ON THE SKIN ARE PROBABLY RELATED TO ITS ROLE AS A CO-FACTOR IN A NUMBER OF ENZYMATIC REACTIONS. AT THE BIOCHEMICAL LEVEL, L-ASCORBIC ACID PROMOTES SYNTHESIS OF NEW COLLAGEN, PROMOTES EXPRESSION OF TYPE 1 AND TYPE 4 COLLAGEN AND ASCORBIC ACID TRANSPORTERS, AND INHIBITS THE ACTIVITY OF MATRIX METALLOPROTEINASES (ENZYMES CAPABLE OF BREAKING DOWN COLLAGEN AND ELASTIN). 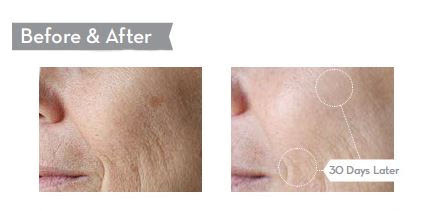 VISUALLY, THE USE OF L-ASCORBIC ACID IMPROVES WRINKLES AND DECREASES INFLAMMATION. L-ASCORBIC ACID IS IMPORTANT FOR PLANTS AND ANIMALS BECAUSE IT WORKS AS AN ANTIOXIDANT. MORE SPECIFICALLY, IT IS A WATER SOLUBLE ANTIOXIDANT, AND THIS MEANS THAT IT CAN WORK IN ALMOST ALL THE REACTIONS OCCURRING IN THE CELL. A DAYTIME VITAMIN C SERUM THAT DELIVERS ADVANCED ENVIRONMENTAL PROTECTION AND IMPROVES THE APPEARANCE OF LINES AND WRINKLES, LOSS OF FIRMNESS, AND BRIGHTENS SKIN'S COMPLEXION THE ACIDITY OF ASCORBIC ACID (L) IN OUR VITAMIN C SERUM WILL CHEMICALLY EXFOLIATE AND PROMOTE SKIN REJUVENATION. PROMOTES ELASTICITY AND COLLAGEN SYNTHESIS, REDUCES FREE RADICALS FORMED BY THE SUN AND HELPS ELIMINATE THE FORMATION OF DARK SPOTS. WATER, ASCORBIC ACID, GLYCERIN, SODIUM HYALURONATE, FERULIC ACID, PHLORETIN, PUNICA GRANATUM (POMEGRANATE) SEED OIL, TOCOTRIENOLS, ALPHA-D-TOCOPHEROL, ASTAXANTHIN, LYCOPENE, LUTEIN, R-ALPHA LIPOIC ACID, BETA-CAROTENE, XANTHAN GUM, CITRUS MEDICA LIMONUM (LEMON) JUICE EXTRACT, CITRUS AURANTIUM DULCIS (ORANGE) JUICE EXTRACT, PHENOXYETHANOL, CAPRYLYL GLYCOL, SORBIC ACID. *THE LEMON AND ORANGE EXTRACTS IN THIS FORMULA ARE JUICE POWDERS. THESE ARE NOT ESSENTIAL OILS AND DO NOT CONTAIN THE SENSITIZING PROPERTIES THAT SOME CITRUS ESSENTIAL OILS ARE KNOWN TO HAVE. USAGE WILL DEPEND ON INDIVIDUAL TOLERANCE TO THE ACIDITY OF THE SERUM. TEST THE SERUM ON THE INSIDE OF YOUR ARM FIRST AND RINSE WELL IF YOU FEEL ANY DISCOMFORT. THE SERUM CAN BE DILUTED WITH USAGE WILL DEPEND ON INDIVIDUAL TOLERANCE TO THE ACIDITY OF THE SERUM. TEST THE SERUM ON THE INSIDE OF YOUR ARM FIRST AND RINSE WELL IF YOU FEEL ANY DISCOMFORT. THE SERUM CAN BE DILUTED WITH NUTRIENT SERUM OR KEEPING IT CALM IN ORDER TO MAKE IT MORE SUITABLE FOR SENSITIVE SKIN. WE RECOMMEND APPLYING A THIN LAYER OF SERUM TO CLEAN SKIN ONCE OR TWICE WEEKLY. VITAMIN C SERUM CAN BE APPLIED ON THE FACE, NECK, OR WHEREVER YOUR SKIN IS IN NEED OF EXFOLIATION AND RENEWAL, KEEPING AWAY FROM THE EYES. IN ORDER TO MAKE IT MORE SUITABLE FOR SENSITIVE SKIN. OUR HIGH CONCENTRATION L-ASCORBIC ACID SERUM IS A GREAT EXFOLIATING OPTIONS. BECAUSE OVER-EXFOLIATION CAN CAUSE INFLAMMATION AND OTHER PROBLEMS, WE RECOMMEND CAREFUL USE OF L-ASCORBIC ACID SERUM. USAGE ONCE OR TWICE A WEEK IS OPTIMAL FOR MOST SKIN TYPES. FOR A VITAMIN C-SERUM TO ACTUALLY BE A VITAMIN C-SERUM, THE ASCORBIC ACID DERIVATIVE MUST BE STABLE (SO IT IS NOT OXIDIZED BEFORE YOU APPLY IT TO YOUR SKIN), AND IT MUST HAVE VITAMIN C ACTIVITY IN VIVO. THIS WILL REQUIRE THAT THE DERIVATIVE IS BROKEN DOWN IN THE SKIN TO PRODUCE ASCORBIC ACID AND HAS TO DISPLAY ANTIOXIDANT ACTIVITY, MELANIN INHIBITION, PROTECTION FROM UV RADIATION, ETC. ACCORDING TO THIS VERY COMMON SENSE DEFINITION, SOME VITAMIN C-SERUMS ON THE MARKET ARE PROBABLY NOT C-SERUMS. SO HAPPY! I STARTED USING THE 3 PC. LIGHTENING KIT FROM JOLI VISAGE SKINCARE. I HAVE MELASMA AROUND MY CHEEKS AND THE SIDES OF MY JAW. I HAVE SEEN SUCH A DRAMATIC DIFFERENCE BY LAYERING THE EXCEPTIONNELLE C SERUM, EXCEPTIONNELLE A CREME AND TRANSFORMING AHA. I AM SO THRILLED BY THE RESULTS! LOVE THIS VIT. C. I'VE BEEN GOING TO JOLIE DAY SPA FOR A VERY LONG TIME AND LOVE THE PRODUCTS. I LOOK FORWARD TO PURCHASING NEW FORMULA'S AND THIS NEW VIT. C IS REALLY. AMAZING! I AM 82 AND MY SKIN LOOKS EVEN MORE VIBRANT AND YOUTHFUL SINCE. I'VE ADDED THIS TO MY REGIME! JUST HAD TO TRY!. MY FRIEND STARTED USING THE EXCEPTIONNELLE C SERUM AND RECOMMENDED IT TO ME!. I CAN SEE WHY. MY SKIN HAS BRIGHTENED AND LOOKS SO MUCH MORE HEALTHY.. I LOVE THIS PRODUCT, AND A LITTLE GOES ALONG WAY! SIMPLY THE BEST! 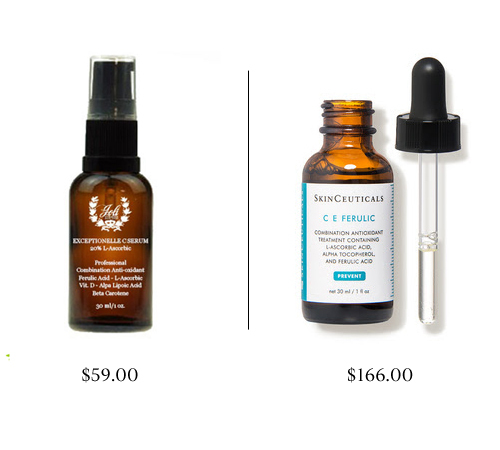 THIS FORMULA IS AS GOOD A SKINCEUTICALS BUT 50% OF THE COST. IT'S THE BEST ANTI-AGING SERUM AND I CAN SEE A VISIBLE CHANGE IN MY SKIN EACH MONTH I CONTINUE TO USE IT!!!!!!! !